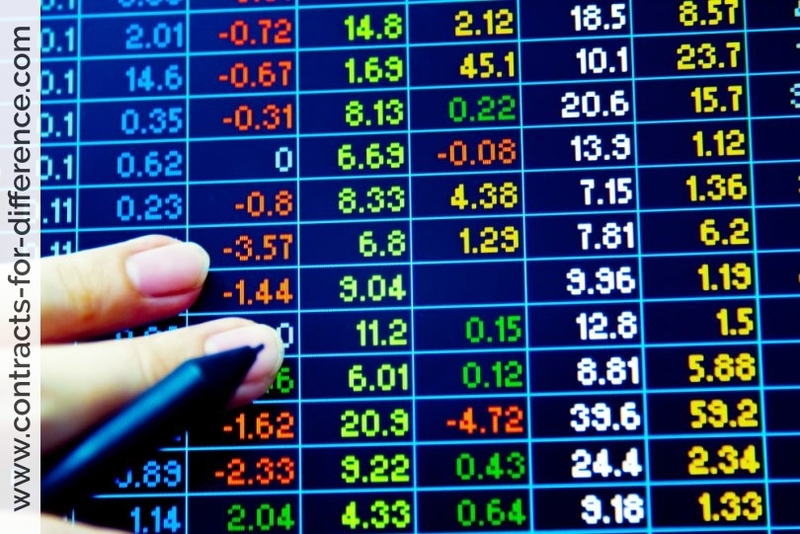 Contracts-For-Difference.com > How CFDs are Priced > What is Level 2? Who needs it? If you are in a theatre, watching an unfamiliar play, you only get to see what is happening on stage. Whereas if you have access to the wings you can see what is happening just off stage – ie who is coming on next and what is their apparent demeanour. If you can see that someone about to come on is carrying a raised dagger you can reasonably assume the plot is about to take a nastier turn than if someone were coming on soon with a birthday cake. 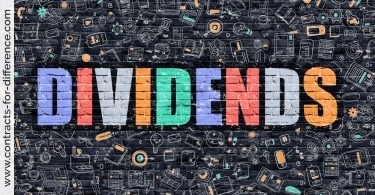 Most investors have free access to the headline share price of each stock. Sometimes called the yellowstrip price. Either live, or slightly delayed. That headline price (normally displayed as two prices side-by-side, the lesser one being what you would get per share if selling, the greater one being what you would pay if buying). Those two prices are the best available from two unseen gaggles of players queueing to come on at stage left and stage right. (When a single price is shown – such as in teletext or newspapers – that is usually the mid-rise, which is a notional average of the buying and selling price). For the keen investor or trader, it is very useful to know the demeanour of those in the queue. Does their behaviour and the prices they are waving suggest an imminent fall in the headline price? Or an imminent surge? Those who pay for what is called ‘Level 2 Data’ are allowed to see what is going on just off stage. It may be that there are a hundred people queuing to sell, and only 3 people queueing to buy. Or vice versa. There may be a huge gap beteen the currently visible headline price and the price which is next in line to take its place. Below is an old snapshot of a Level 2 display for Barclays Bank. If you wanted to sell say 3500 Barclay shares, you might expect to get the yellowstrip price of 517.25p each for them, as there are sufficient buyers prepared to pay that much for quanties comfortably exceeding the number you are selling. If you wanted to dispose of a quantity greater than 17465 (say 25000) you might have to accept that some of them would go to buyers offering only 517p each. And so on. Your 25,000 disposal would have satisfied the first five buyers in the queue and reduced the amount that buyer number six is looking for. If you were buying say 4500 shares, you might expect to pay 517.5p for them, as there are well over that quantity on the table (16628) at that price. If you wanted say 20,000 you would expect to pay 517.5p for most of them and 518p for the rest and your contract note would show a share price that reflects that blending. 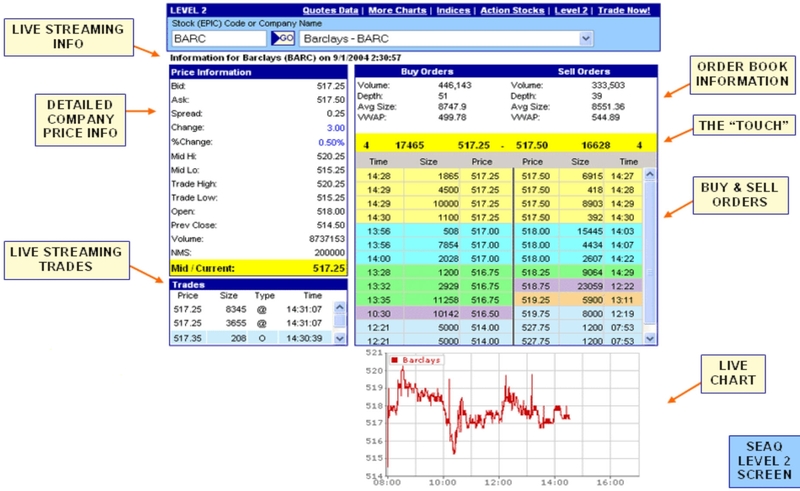 On a busy stock such as BARC, the orders on both sides are changing all the time. So the quantity available at the headline (yellowstrip) price might rapidly dwindle or grow in one column or both. If the 517.25p ‘buy’ orders on the left are suddenly taken out by someone dumping say 20,000 shares, the 517p price might then occupy the top spot, giving a yellowstrip price of 517p-517.5p (ie the spread will have widened from a quarter penny to a half penny). The live streaming trades column is shown in time order ascending, with the most recent trades declared through the LSE on the top line. For example, the first column shows the price the stock was traded at (517.25). The second column shows that the trade involved a volume of 8,345 shares. The third column displays the trade code showing the type of trade that was made (@ = buy; O = Sell). Whilst the fourth column tells us that the trade took place at 14:31:07. 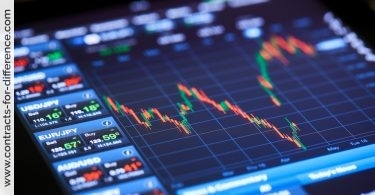 The most recently listed trade will set the current price of the stock in question. Our Level 1 window, displays live bid and ask, spread, movement, (blue for up, green for no change and red for down), mid price hi/lo for that day, (the actual calculated price between the spreads also shown in bold on the yellow strip), highest and lowest traded price for that day, the day’s opening price and the previous day’s close. Volume shows the amount traded for the day, and the NMS stands for Normal Market Size, i.e. the normal volume traded each time calculated over a period. Detailed order book information, showing the average volume of buy and sell orders, the depth (number of orders) awaiting execution in the order book. The average size simply divides the volume of each order by depth. In this example we can see the average size of buy orders only slightly outweighs the sell orders, but the actual number of buy orders is substantially higher. Finally the VWAP, the Volume Weighted Average Price, calculates the average price, in the buy instance of 51 orders, and in the sell instance 39 orders. Traders who are skilled at reading and interpreting Level 2 can see patterns of behaviour that indicate a build-up of buying or selling pressure, which might be expected to push the price up or down moments later, and which will influence their own decision-making. They can sometimes also recognize deceptive behaviour (eg a buildup of orders which are repeatedly pulled from the list if they get near the front of the queue and re-entered in identical quantity at a more distant price, ie bogus orders being used to generate an impression of a groundswell with no serious intention of actually trading). The people putting these orders into play include everyone, from major institutions down to individual private traders (though you need a specific arrangement via which you are granted access to do so and for which there is a small charge each time). That system, in which all and sundry place orders electronically, is called SETS. It operates among the larger stocks (FTSE-100 and some others). At the opposite end of the market, most smaller companies employ a system called SEAQ, in which the only people posting prices in the buy and sell columns are an appointed handful of named ‘marketmakers’ whose job is to generate a market in the shares of a stock by adjusting their own chosen buy and sell quotes sufficiently to tempt investors into buying or selling in sufficient quantity to satisfy whatever opposite trades are waiting to be fulfilled. In between the (‘order driven’) SETS stocks at the top end, and the (‘quote driven’) SEAQ (or ‘MarketMaker’) stocks at the bottom end, there is a hybrid zone called SETS/MM within which the named market makers are on hand to move the price when needed, but who tend to sit back from the fray at times (lower down the column) when orders are being posted by individuals and others. The format of the Level 2 display is the same for SETS, SETS/MM and SEAQ, but the content (the mix of orders or MM prices within that grid) will look different and will be interpreted differently. On SEAQ stocks for example, where the only prices showing are from a fixed number of market makers (which may be as few as 1 or two on tiny stocks, up to a dozen or more on busier ones) the watcher will note whether MMs away from the publicly visible yellowstrip price, are beginning to distance themselves from that price or to close in on it. Some of the activity among MMs on quieter stocks can usefully give several minutes or more warning of imminent change in the headline price, and in some cases half an hour or more. Though again there is some skill in judging whether the MMs are genuinely responding to market interest in the stock or merely attempting to temporarily engineer a price movement to suit some specific client who is wanting to acquire or dispose of a concealed large quantity. For the short term trader, who only has days or weeks for the price to move the way they want, Level 2 can be extremely helpful in knowing when to jump onboard quickly, or to get out quickly ahead of a price move that is about to happen. Or maybe back off from placing an intended trade if the Level 2 data shows an imminent bad move brewing. For the daytrader (someone who doesn’t risk holding stocks overnight but looks to instead make gains in hours or minutes) level 2 is essential. As is a sophisticated awareness of how to interpret it. Level 2 is of less use to the longer term investor for whom minor daily fluctuations are irelevant. It can help them in obtaining the best entry level on Day One, but isn’t worth subscribing for unless also making frequent shorter term trades. When using the order book be very careful when typing in your order. The order book is the market and any error inputting your requirements can be quite costly and very difficult to amend. For example, the simple error of typing in a price that you are willing to pay which is much higher than the current price may result in you paying a much higher average price than you should have done and this would be almost impossible to undo. Also be very careful with typing in the quantity, this is another area for making a silly mistake which will be very difficult to unwind. This is an important factor to consider. If, for example, you placed an order to sell your 1,000 Carnival at £29.90, but only 500 were sold before the price fell, you will have paid commission on a partial sale at that level, but if you were to amend the price to a lower level at which you were willing to sell the remaining holding, this will be considered to be a new order and you will pay a second lot of commission. If you are dealing in a sizeable amount, the impact of this will not be so great, but it will add up for smaller trades. The answer is to watch the market very carefully to ensure that you get the price you want for all of your stock. The alternative to using Level 2 is a quote driven system. This is basically as it says a pure quote without any details about market depth as you get with Level 2. All brokerages will operate some form of quote driven system based on the underlying market quote derived from what is happening on the Level 2 system. What you have to be very careful of is that because you are deemed to be an intermediate customer, the brokerage is not obligated to give best execution which basically means that the quote they offer to you may differ fractionally from the underlying market. This means that, for example, British Airways could be quoted at £2.05 to £2.06 in the market, but a quote driven system may offer you £2.0475 to £2.0625, the broker then keeps the difference. This is why some brokers will offer a deal for free service. The reason it is free is that the broker has increased the spread around the underlying market price which enables them to make a profit on your transaction without having to charge commission. It always pays to find out exactly how your broker works, it can save you a lot of money in transaction charges.